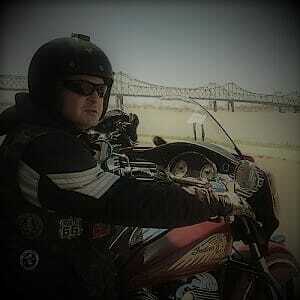 There’s no better test of a new motorcycle than a Coast To Coast ride across America. Riding for two weeks straight, through all kinds of traffic situations, road and weather environments, provides a very clear sense of a bike’s strengths and weaknesses. Over 3000 miles, you’re either going to become very close friends with a motorcycle, or count the minutes until you can get off it. We’re very fortunate that our pal Shawn at EagleRider Motorcycles arranged for two brand new 2014 Indian Motorcycles to be sent to EagleRider Orlando for us to ride to Los Angeles. The new Indians certainly look the business; 111 cubic inch motor (1819 cc) delivering 119 foot pounds of torque at 3000 rpm, 6 speed gearbox, slathered in chrome, gorgeous deep paint and leather. Two different bikes showed up in Orlando: the Chief Vintage, a “soft bagger” with a decidedly vintage appearance, and the Chieftain, a faired hard bagger with a host of modern features. Our ride from Orlando to Los Angeles is our fourth Coast To Coast motorcycle journey; two of the previous trips were done on Harleys Davidsons (Road King, Street Glide and Electra Glide). So we have very direct experience riding what would be the Indian’s main competitors across America, under similar circumstances: 3000+ miles from the Atlantic to the Pacific. We’ve come to consider the touring Harleys to be the best mounts to cross America on – comfortable, good gas mileage, and a road feel that draws you in over such a big ride. Our expectation was that the Indians would have a very difficult time competing with the Harleys, as Harley incrementally improves their bikes every year and has over 100 years of uninterrupted production. 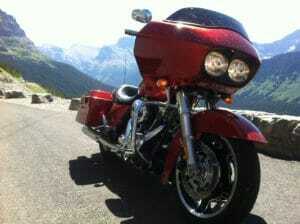 Say what you will about Harley Davidson idiosyncrasies, the bikes are very capable. So it surprised us how little time spent in the saddle it took for us to realize that the new Indian Motorcycles completely trounce any stock Harley we’ve ridden in acceleration, handling and braking, and more importantly, in the sense of confidence the rider gets while riding these bikes. Compared to the Japanese cruiser products (and to be frank, Victory Motorcycles as well), Harley Davidson has always had the advantage of their long history and a brand image that’s deeply ingrained even in the minds of people who are not motorcycle riders. 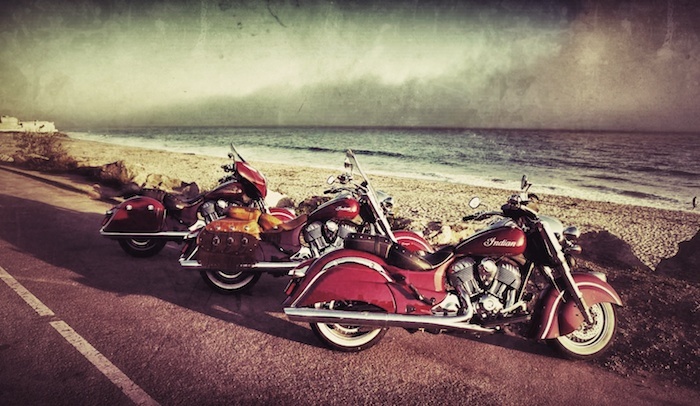 Indian is probably the only brand that could compete in any way, as the fondness for these bikes has lingered since they went bankrupt in 1953. But image doesn’t mean much when the bike is leaned over in a corner at speed and starts wobbling around. Indian seem to have understood this when designing their new bikes, which have an incredibly planted feel in corners. These bikes like to be tossed around, far more than you’d think an 800 pound motorcycle would do. The acceleration is impressive too: under 6th gear roll-ons at 70 mph, the Chiefs pull without any hesitation or stumble, and achieve hyper-speed quite quickly. It’s incredibly easy to get into lose your license territory on these bikes, but thankfully, the Indians never feel high strung. You can ride these bikes lazily, just like any other cruiser, but when you want to pull the trigger, it’s more like an artillery piece than a shotgun. We’ve got about 750 miles on the bikes so far, and 3/4 of the country left to cross at the time of this writing. We’ll be bringing you much more detailed reviews on both bikes and their various features during the rest of our trip and after – but for the moment, we just wanted to say how impressed we are with the 2014 Indian Motorcycles. We still love our Harley Davidsons (and haven’t yet ridden Project Rushmore bikes yet) but we feel like The Motor Company may need to step up it’s game a bit. 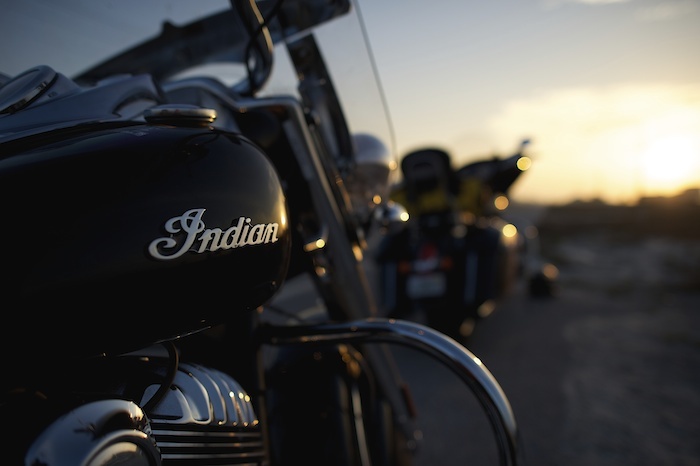 If you’re interested in hiring Indian Motorcycles or other brands in America, Contact Us! 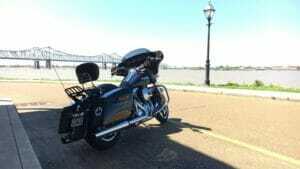 We Ride The 2014 Indians Coast To Coast!